Traditionally, ceramic wafers have been processed with CO2 laser technology, but one company has successfully employed the high brightness of fiber lasers in a proprietry process. Three years on, the results speak for themselves. 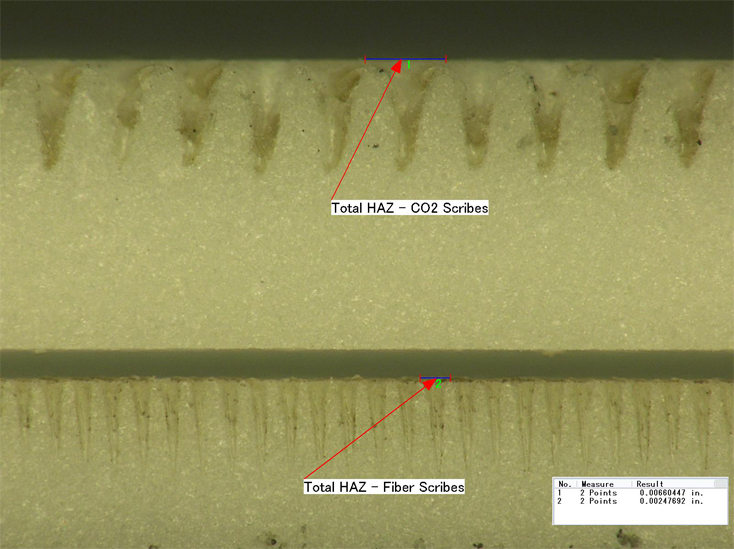 Figure 1: Comparison of the scribe pits generated by CO2 and fiber lasers. Scribing and micromachining of AlN and Al2O3 ceramics has been dominated by the use of CO2 lasers for 30 years, the simple reason being that the 10.6 μm wavelength has been the best suited to processing these types of materials. Nevertheless, feature size and finish quality of the ceramic substrates used for electronics applications had changed little in the last 20 years. The times are now rapidly changing, with LED and automotive sectors demanding miniaturization, higher accuracy and greater flexibility in the ceramic subcomponentry integrated into their assemblies. 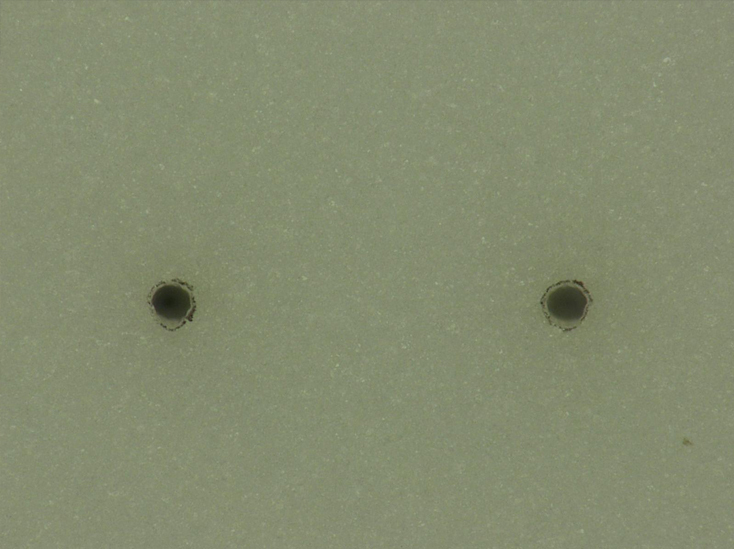 For separation of the ceramic substrates into individual components, a laser is used to scribe (drill) a series of partial (blind), high tolerance holes (Figure 1). Due to the absorption properties of the most common ceramics, CO2 laser technology has proven adequate, where the pulse energy is absorbed over a sufficiently short interaction length at the surface of the ceramic, giving rise to local heating, melting and vaporisation. The holes thus generated penetrate roughly one third of the way through the substrate and create a preferential fault line for subsequent fracture. Using other techniques, vias, slots, locating features and delicate patterns can also be machined into the substrate. However, CO2 laser technology is not without its drawbacks. The accompanying heat affected zone (HAZ), caused by partial melting under the peripherie of the relatively broad focussed spot, is a principal cause of the relatively low resolution and repeatability acheivable. Synchron quickly realised the limitations of CO2 laser technology in the face of increasingly severe demands from the electronics industry. 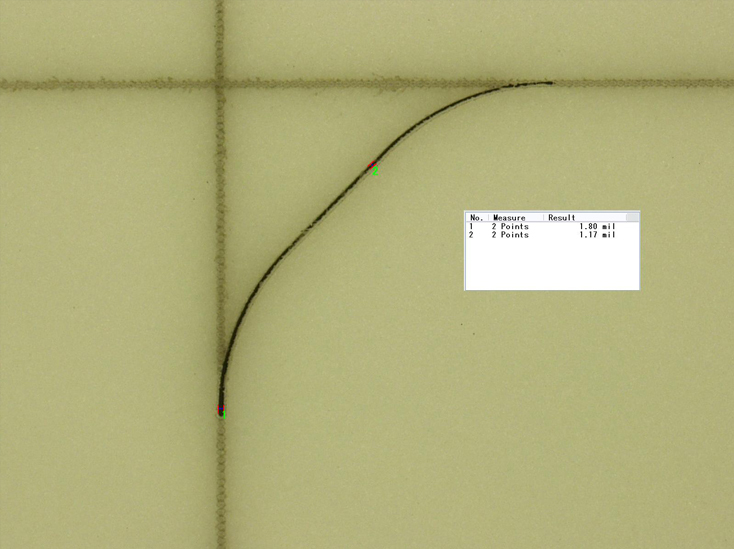 Initial tests with Nd:YAG lasers for this application only proved that the absorption at 1 μm is simply too weak – not enough energy is deposited in the surface layer to generate the desired effect. Synchron thus subsequently developed a surface treatment to enhance the absorption of laser light at these shorter wavelengths on ceramics. The treatment permeates slightly into the surface and enhances the deposition of energy for near infrared laser pulses over a sufficiently short distance to produce the necessary melting and vaporisation. To optimize their process, Synchron uses high brightness fiber lasers from SPI Lasers UK. SPI has been developing fiber lasers for the industrial market for several years, primarily for materials processing applications such as microwelding and microcutting, but also for marking applications. 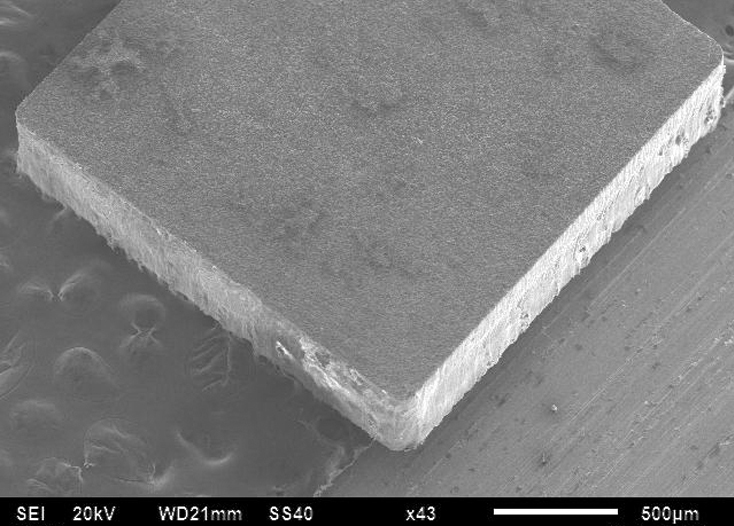 Figure 2: Kerf edge on a form cut from a ceramic wafer. Synchron’s surface treatment essentially enhances the coupling of the fiber laser beam into the top surface of the ceramic to initiate the drilling process. The enhanced dynamics of the interaction between the laser pulse and the material surface, coupled together with a custom, high resolution beam delivery system, mean that significantly smaller features can now be realised in ceramic substrates (Figure 2). After over three years of development, the results speak for themselves. For what is now effectively ›low-end‹ ceramic processing, the new system easily matches the throughput of current state-of-the-art CO2 technology. However, of greater interest is the higher accuracy and finer feature size produced by Synchron’s fiber laser process, providing for geometry capabilities that are simply not possible with the CO2 process. Circuit designers can now dramatically increase circuit densities while holding the same or better production speeds. The bar is quickly being raised in the sector – current manufacturing tolerances are approximately 10 μm, but increasingly severe tolerance demands are being placed, in particular, by manufacturers of high brightness LED units and arrays. the motion system used. High performance linear motor stages hold positional tolerances to 1 μm or less and dynamic geometry tolerances to around 3 μm or less for very small radii of less than 50 μm and 1 to 2 μm for larger features (Figure 3 and 4). other materials processing applications. The exceptionally high quality beam profile is available at all output powers right across the range of possible pulse parameters, thereby permitting large working distances (stand-off). The high beam quality, coupled together with a high-end optical system translate into high irradiance (brightness) at the focus, enabling high precision processing with minimal HAZ and driving processes traditonally thought unsuitable for near-IR laser technology. Synchron’s proprietary technique breaks new ground in an industry that, while being a vital part of the production of consumer electronic products, has not matched the technological advances made in other materials processing industries. Synchron now manufactures dual- and quad-beam fiber laser processing systems, foremost for destinations in Taiwan. Current systems are installed in a mass production environment for customers that supply circuitry for very high volume consumer electronics, with processing having run ›24/7‹ for over 18 months to-date and operating at speeds that are compatible with the production of several million units per month per system. CO2 lasers have previously dominated production of ceramic substrates for the electronics industry, but a new process delivers feature accuracy at throughput speeds that are simply unattainable with the incumbant technology. Synchron’s process thus looks set to shake up a market which has seen little real development in the finished component for more than 20 years – history in the making. Brett Moon has a background in International Business together with almost two decades of laser experience. Since 2000 he is CEO at Synchron Laser Service in Plymouth, MI, USA. Richard Budd has a background in electronics design and the physical sciences, and is Senior Engineer at Synchron. Andy Appleyard is Product Line Manager for cw/modulated fiber lasers at SPI Lasers in Southampton, UK.